I share with you my thoughts. But I don’t share all of them. I share with you my struggles, but not every one. And there are many. But a few nights ago, I was reading and the author posed the question, “Are you being a good steward of your Grace Story?” It made me think. 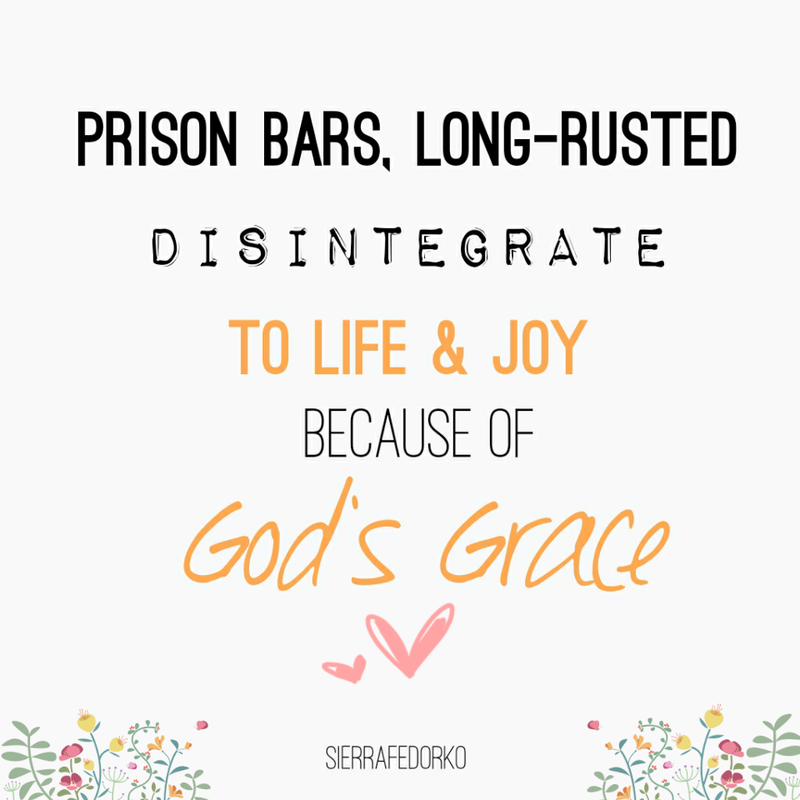 Do I use this blog as a way to show you how God has poured grace upon grace into me? Have I really shown you? Have I written to you my story of Grace? Can you tell by my life, by my words that God is great and He is so very real? I don’t share with you everything about my life, and I know I never will. But I also know I’ve been hesitant in showing you how God has poured grace into me over the last few months. It’s been an 8 months full of learning, and perhaps not in all the ways that you would expect. But rather in my very own heart. Parts of me have been uprooted, replanted, watered…and it’s been a painful process. Several months ago, I saw, among other things, my self-righteousness. It’s hard to write about self-righteousness without sounding…self-righteous. So I’m going to write to you through the lens of God’s grace. It overflowed my soul in September, washing out, washing through, washing beneath, and in, and over me. Asking forgiveness of those closest to me, granted. God forgiving me so completely upon my request. I saw pride. The desire, the craving for public praise, for recognition, and applause. All of which battered me and left me empty. And then, I turned to God and my worth had never changed. Not even once in the time of all my scrounging around for crumbs beneath a table of humanity. I saw envy. After every gift, blessing, joy, and goodness thrown into my life–I still wanted. Until I abandoned all the noise, asked forgiveness, embraced grace, and thrilled at my own story given by my God. I looked at all of it again and I loved it, because God has chosen it for me. I saw, in crushing focus, my depravity. But upon the stark, somber, heartbreaking view of my own flesh, I saw God’s grace, so ready, so full, so gentle, so hard, and so, so lovingly waiting for me to ask and be given. I walked in the dark, and as everything was stripped back, I saw. And as every veiled curtain saying “Sierra, you’re fine just like this” was torn, I began to live again in God’s strength, His grace. There was freedom! Prison bars, long rusted, disintegrated to life, into joy. Psalms 103:12 As far as the east is from the west, so far does he remove our transgressions from us. And this joy, this joy that started out tentative and excitedly has only grown as I’ve learned to share in the joy of my friends and family. It’s not perfect. It’s cracked. Sometimes, I choose envy, before abandoning, and choosing joy again. But then— it’s not really joy I’m choosing. over and over and over again. I’m fighting the battles within my heart that hit against all sides with weapons of envy, pride, and self-righteousness. I can’t tell you how many times I lie down in defeat, letting a weakness wrap its icy hands around my neck. But I also can’t tell you how many times I have received God’s forgiveness and how often His grace pours over me. And I can rise up again, in God’s strength, to continue to fight the lifelong battles before me. There is joy in following God! There is peace in surrendering my heart, my life, my will to Him daily. There is freedom in the shadow of His wings, and there is grace, abundant, and it overflows for me. It is not just September Grace, but it is October Grace, and November Grace, December, January, February, March, April, May, June, July, and August Grace. It is Everyday Grace. It is God’s grace forevermore. For me! My Grace Story is never-ending, because I am human. I am a sinner. And I need God. I need His grace every hour, every moment. I don’t post this so you can gawk at my messy heart. I post this so you can be in awe that God gives grace to this messy heart, making it beautiful, making it more like Him. So true! I believe the longer I live the more I see my sinfulness. It’s a constant battle. Thanks for sharing. This post was such a blessing! I’m so thankful you found it encouraging. The older I become, the more I think “Lord, come quickly!” It is tiring to fight these constant battles, but God’s grace abounds, He is Love, and gives to us new mercies each day, & He never loves us less or more! Miracle of Miracles–God’s love for me! Love this! I am in so much need of Gods grace as well! It really is incredible and that is awesome! I have been working on dwelling on who I am in Christ and his love for me, instead of seeking around me for acceptance. How God could love me this much and give me grace all the times I don’t deserve it is immeasurably non understandable!